Did you have a good Valentine’s Day? I don’t think I have been told to celebrate Valentine’s Day more than yesterday (and I forgot to call my parents, OOPS!). It almost felt like a national holiday, with everyone at work asking about the evening plans, rushing to finish early for the weekend. Is it because Texans are just so friendly? Or because Americans love holidays? Rob and I have never been big fan of V-Day, enjoying each other’s company more than anything else. Rare gifts and certainly no cards, this year was the most low-key ever. A nice dinner with friends. True to his word, Rob and Matt had a feast ready for me just as I stepped (pedalled) home: Holy Moley Veggie and Rice Soup and corn tortillas followed by Chocolate Peanut Butter Balls. Actually, the order was reversed, we ate the dessert as an appetizer while we waited for the veggies to cook. I had offered to make dessert but Rob saved the day. Rob also registered us for Cycle Oregon. Tent porter, and all: we’re committed. Lucky (or unlucky) for me, cycling is easier on me than walking. Now about the food. 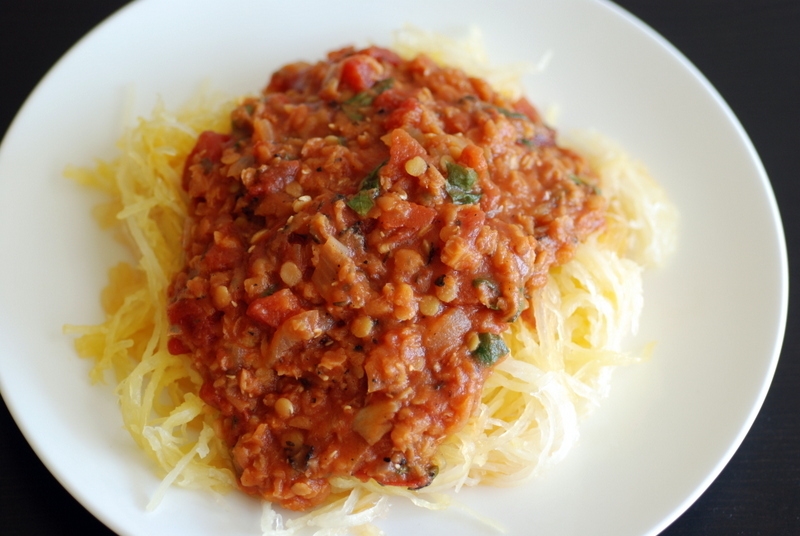 For anyone looking for a fun twist on spaghetti, this is a delicious marinara sauce. A heartier, cooked version of my 15-minute garlic basil marinara sauce, I fortified the sauce with red lentils. The finishing raw garlic and basil made the sauce truly special. 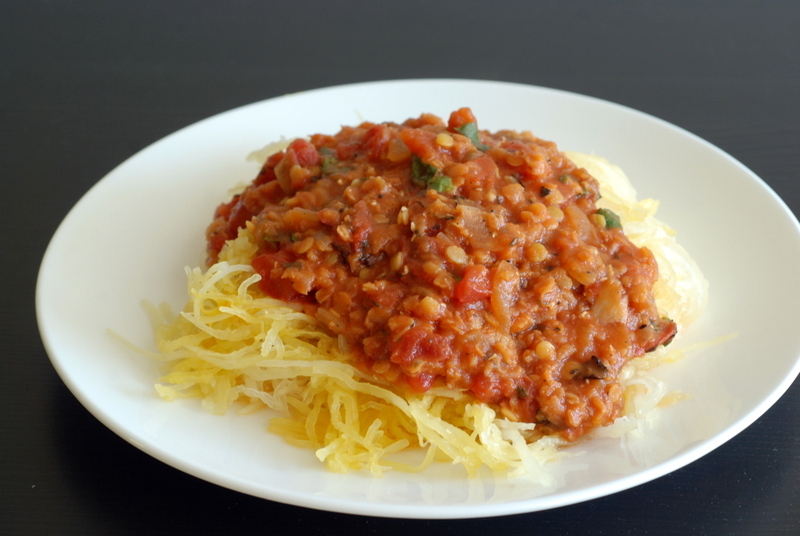 I swapped the raw zucchini noodles for winter’s veggie noodle: spaghetti squash. While those expecting a noodle replica will be disappointed, those looking for a fun veggie side will be thrilled. A new texture and a fun way to slurp up all the delicious sauce. This is my submission to this month’s Credit Crunch Munch, Extra Veg, Vegan Linky Potluck, Pasta Please, Simple and in Season and Cooking with Herbs. Moroccan Harira with Eggplant and Chickpeas & Isa Does It Giveaway! See below for the giveaway for Isa Does It! As such, Isa Does It highlights mostly simple, quicker recipes (under 30 minutes!) that are foremost tasty. This is a cookbook for the beginner chef as well as those who want to reinvigorate their kitchens with new scents and textures, without breaking the bank or spending hours on top of the stove. Isa explains how she stocks her pantry, her kitchen cabinets and then details specific beginner techniques (with step-by-step photos), such as how to butcher tofu and tempeh. With 11 recipe chapters that span the gamut from quick soups, salads, handheld, bowls, curries and stir fries, there is a lot of variety. Furthermore, not much is left untouched as Isa also includes fancier “Sunday night suppers” and breakfast/brunch ideas, too. Rest assured, complete meals are encouraged as desserts are included, too. I admire Isa for a fabulously tantalizing blog, sharing her delicious creations. I guess it should be no surprise that some of my favourite recipes from her blog appear in the cookbook (see below). In addition, of the 150 recipes in the cookbook, the majority are brand-spanking new. Beefy asparagus stir-fry with fresh herbs. Okra gumbo with chickpeas and kidney beans. Quinoa Caesar salad. 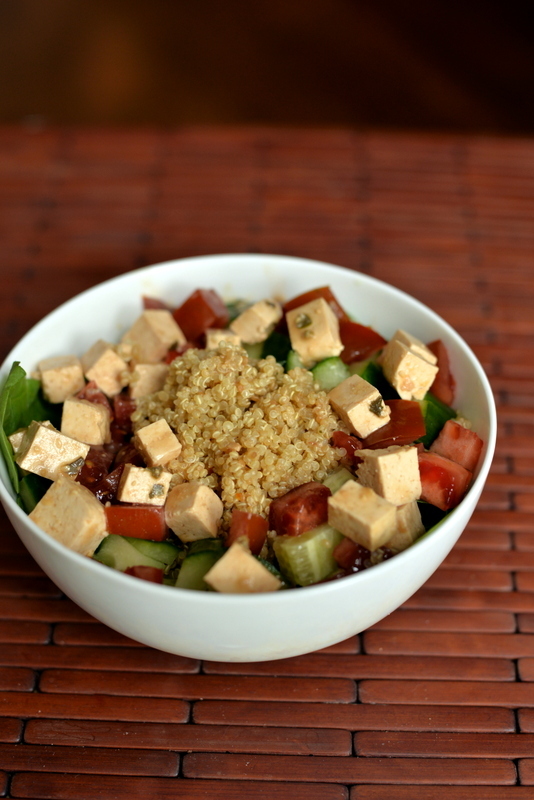 Cucumber Ranch bowl with breaded tofu. Edamame hummus and tofu wraps. Belgian beer and seitan stew. Baked garlic-curry fries. 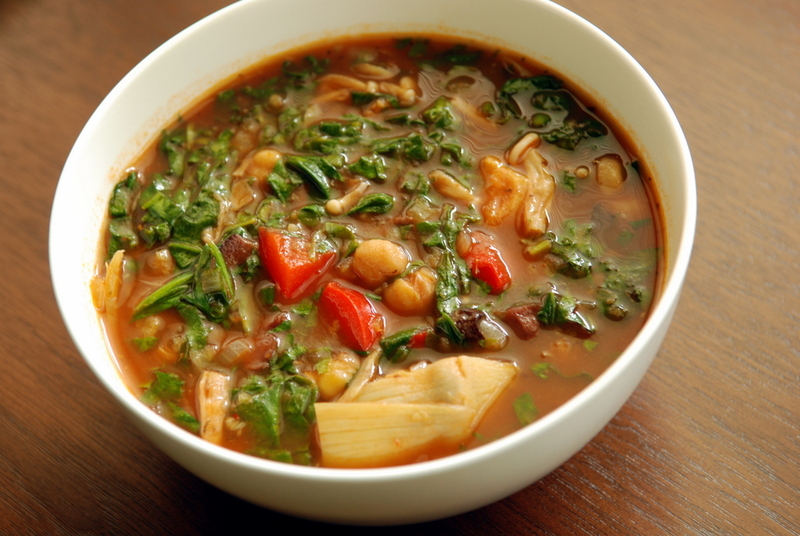 Chickpea-Rice soup with cabbage. Coconut chana saag. Chandra Malai kofta. Goddess noodles with tempeh and broccoli. My Thai overnight scramble, breakfast scrambled chickpeas, oh please. If you have tried Isa’s recipe before, you know the name of each dish never gives you the full picture. They are very descriptive of the ingredients, but something so simple may be more than the sum of its parts. I am eagerly waiting to pounce through this cookbook, page-by-page. Chocolate gingerbread cookies, anyone? I can already vouch for the ancho lentil tacos, tempeh orzilla, Jerk Sloppy Joes, lemon-garlic fava beans and mushrooms, chana masala (not my favourite but Rob liked it well enough), cucumber avocado tea sandwiches, chai spiced snickerdoodles, and now her delicious Moroccan harira with eggplant and chickpeas. 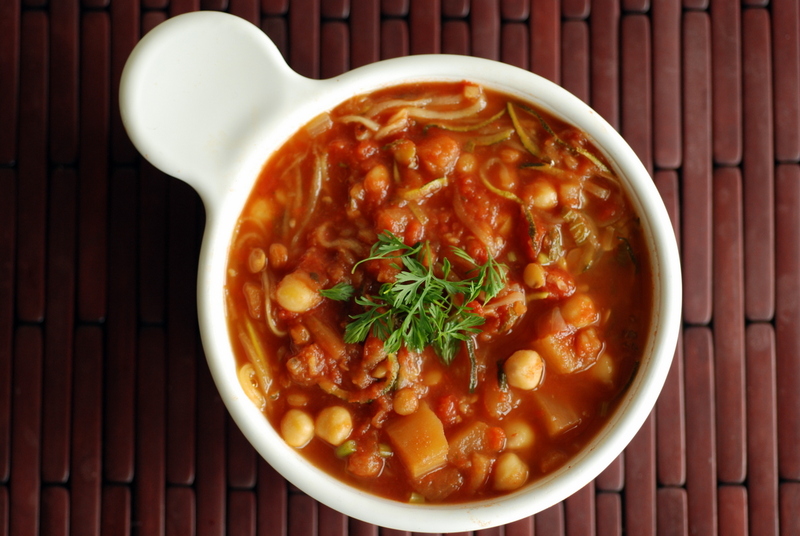 Harira is a Moroccan soup/stew that I have been meaning to recreate since I travelled to Morocco. Let’s just say it has been on my to-make list for many years. It wasn’t until I saw Isa’s recipe that I jumped at the chance to try it out. Harira is a very forgiving recipe. As I travelled through Morocco, nearly every restaurant had a different version of harira. Some with chickpeas, some with lentils, sometimes both beans, some with tomatoes, others with ginger, some with herbs, others not. I cannot say that I saw any with eggplant, but that is Isa’s slant. First, I made a few tweaks to Isa’s recipe… mainly because I had no vegetable broth, so I used my impromptu nooch plus random spice blend. This time, I threw in dried parsley, lemon pepper and the 21-spice seasoning from Trader Joe’s. I also substituted spiralized zucchini for the noodles. Ingenious, if I may say so myself. Anyways, less about me, more about Isa. This soup was great. Bulky and satisfying with chickpeas and lentils in a flavourful tomato broth spiced with ginger, cinnamon, smoked paprika and saffron. Fresh mint and cilantro add a lightness, along with the finishing lemon juice. I use saffron so sparingly I am glad I finally found a great use for it! The textural foil of the noodles with the beans was perfect. For someone new to veganism, the ingredient lists in her recipes may still seem a tad overwhelming (vital wheat gluten, nutritional yeast, chickpea flour, cashews, wine and fresh herbs) but these are rather commonplace in a vegan’s kitchen. Except the saffron, because well, that’s not a regular ingredient. Once you have access to fresh herbs, it is hard to return to the dried ones, so I understand the recent push for quality ingredients. I really want to share this cookbook with you. Thankfully the publisher is letting me give a cookbook to one reader living in the US or Canada. To be entered, please leave a comment here, telling me about your favourite Isa recipe. If you haven’t made anything by Isa yet, have a look through the table of contents of Isa Does It on amazon (or my list below) and tell me what you want to cook the most. I will randomly select a winner on October 31, 2013. Good luck! PS. Today is also the last day to enter my giveaway for The Ayurvedic Vegan Kitchen. Enter here. PPS. If you pre-ordered your cookbook already, don’t forget to get your free Isa Does It tote bag. This is my submission to Deb for this week’s Souper Sundays and to next month’s Veg Cookbook Club. What is the most underrated herb? Some herbs get all the love: basil, thyme, rosemary, oregano and mint were easy picks when I started my herb garden a few years ago. I also planted sage last year since it was easy to grow, while still mostly unfamiliar. I also really enjoy lemon verbena, although I only ever used it as a tisane (it would make delicious ice cream, though). Sadly, most of my herbs died over the winter, despite living in the warm comfort of our kitchen. One plant was hardy enough to survive our kitchen winter and popped its head out again: chives. And despite growing them for 3 summers, I rarely used them in my cooking. While I caved and bought some new plants last month (it was Red Russian kale! and basil!) at my local grocer, my basil has not yet grown enough for a harvest just yet. So, I improvised for this recipe. 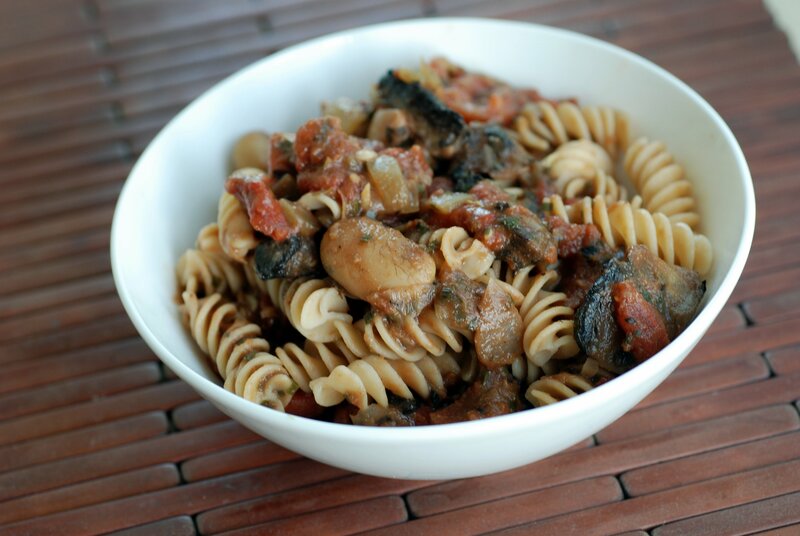 A chunky yet creamy tomato mushroom sauce. Yes, fresh basil would be delightful. I compromised. Instead, I used dried basil and added fresh chives. (I thought perhaps some pesto could substitute for the fresh basil but my Mom suggested going with the chives instead). My Mom did not lead me astray: it was very good. 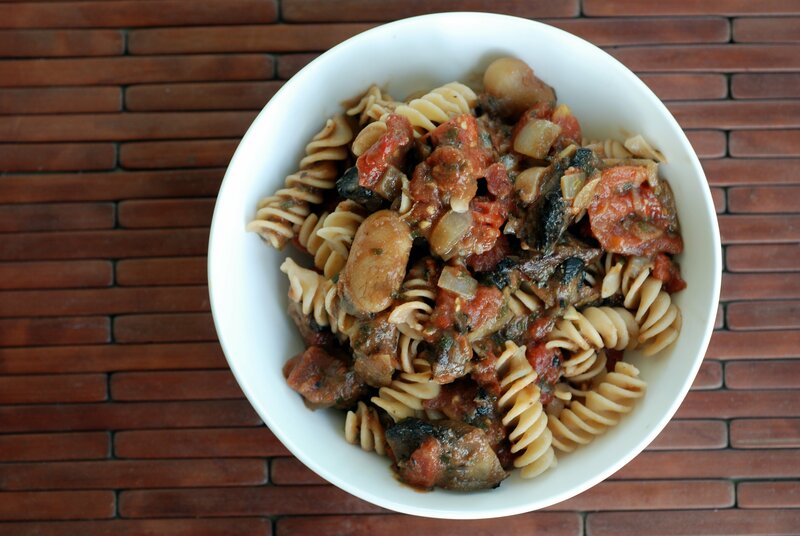 This is a quick-and-easy chunky tomato sauce, with big chunks of tomato, chopped mushrooms and giant corona beans that I snuck in at the last moment. Just like when I made The World’s Healthiest Bolognese Sauce, nutritional yeast added creaminess with a hint of cheesiness. The dried herbs worked well and the chives gave a different twist to the sauce. Next time, though, I may try the tomato-pesto sauce, too – it isn’t a novel idea. Although I wanted to serve this with soba noodles, the sauce was too chunky for such delicate pasta. Instead, I pulled out a chunky noodle. We have tried a few bean-based pastas, but this was a different brand and a different bean. Made with chickpeas but still fusilli, though. A fun shape and it worked well with the sauce. This is my submission this month‘s Simple and In Season and to this month‘s Herbs on Saturday. I think my pantry-purge has been going the wrong way. I am no longer accumulating new esoteric ingredients but I struggled with whether or not to replenish my staples. Could I live without chickpeas for a few months? Absolutely not. Miso? I replenished that, too. What about olives? I think I could manage olive-free for 6 months. Artichokes? Well, the best artichokes come from the freezer case at Trader Joe’s so I am excited to wait for those. The plan for now: use up the less-loved ingredients. The ones I can part with for a bit of time. Now I can strike these from my pantry: artichokes and olives. What could have been a boring vegetable stew was helped with said pantry items. Olives add the salty punch to this spring-like tomato stew with red pepper, mushrooms, artichokes and spinach. Sometimes I have limited enthusiasm for ingredients that have been stashed at the back of my pantry. Or I only have a limited repertoire for said ingredient. 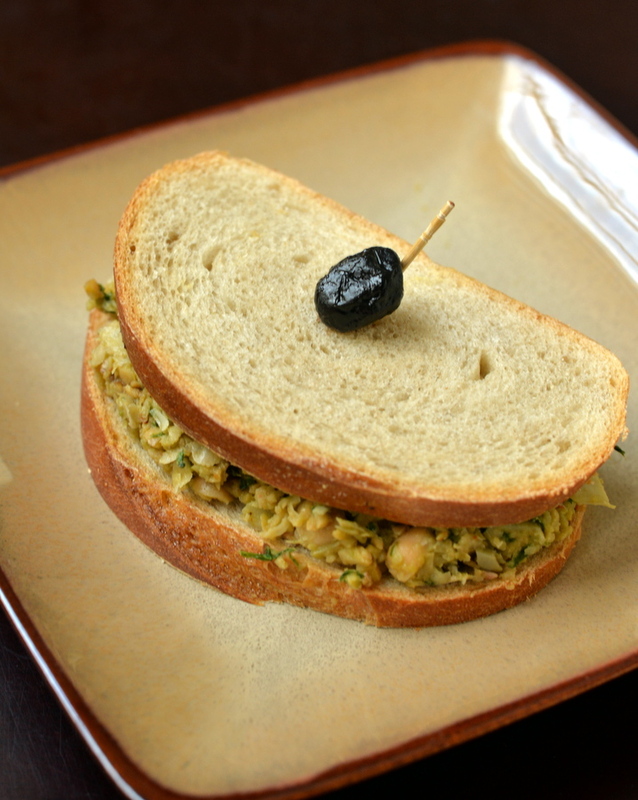 Olives and artichokes are not that wacky, but I am looking for ways to use fun things like kelp noodles, capers, jackfruit, assorted flours (chickpea flour is our staple but I still have some coconut flour, tapioca flour, rice flours and vital wheat gluten), puffed quinoa, dried fruits and nuts. And let’s not forget the things in my freezer: herbs, chopped veggies and fruits, tempeh, and frozen meals ready to go. Do you have a big pantry or have a select collection of favourite ingredients in your pantry? I personally believe that a well-stocked kitchen makes for a well-prepared cook. It makes cooking easier and fun. This is my submission to Deb for this week’s Souper Sundays, Little Thumbs Up event, hosted by Joyce, kitchen flavours, organized by Zoe from Bake For Happy Kids and Doreen for my little favourite D.I.Y.. I am loving the conversations from the last post about the evidence surrounding eating a Mediterranean diet. The New York Times wrote a follow-up article that summarizes my feelings pretty closely: there is a surprising lack of evidence for nutritional recommendations. While in medical school, I remember being taught that the only thing shown to keep weight loss on long-term was bariatric surgery. Perhaps that is because the proper studies have not be done. To be fair, I learned the DASH diet with was better than any single medication to reduce high blood pressure. Hopefully, the flurry of interest from this past study will propel researchers to investigate plant-based whole foods eats. The New York Times suggested a vegan diet is not a long-term option, but I disagree. I love it when I know it is going to be a good week. By Sunday, after I do my batch cooking and a bit of taste testing, I have a good idea how my meals will be for the week. Flops or wins? I never seem to know with these Random Recipes. This one was a big win! Dom pushed us to randomly pick a recipe from our (physical) recipe pile. I still like to print out my recipes for the week and sometimes throw in bonus recipes if there is empty space on my page. While cleaning the kitchen table, I decided to tackle one of my recent but neglected clipped out recipes. Sometimes I am blown away by the simplicity of good food. I wasn’t expecting this to taste so good as it did, so I was pleased to have such great tasting lunches all week. This recipe was for a ribollita, an Italian peasant soup featuring vegetable soup with day-old bread. 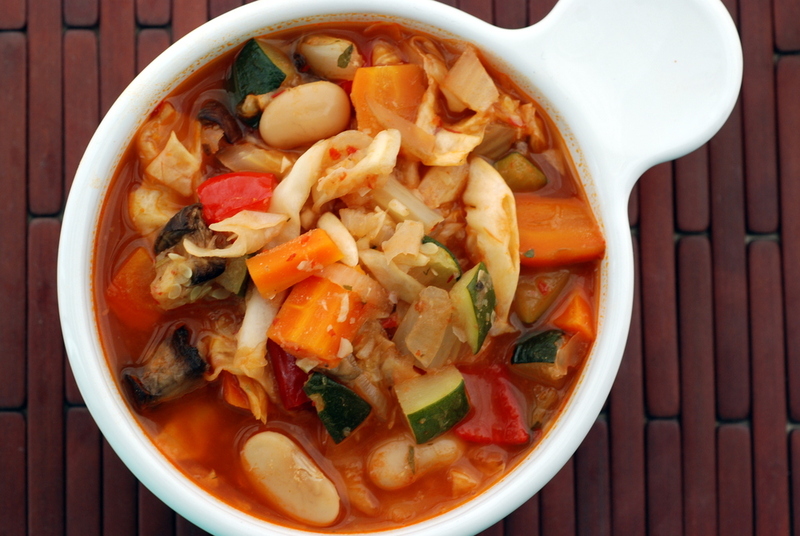 Most versions use leftover vegetable soup, but here we create a complex soup simply from roasted vegetables. Roasted fennel was new to me, but I really liked the medley from roasted red peppers, zucchinis, carrots, mushrooms and onions. White beans add bulk and the giant corona white beans were a perfect match to the chunky vegetables. Sliced cabbage added an almost noodle-like feel with some structure to the vegetable soup. I added both tomato paste and red pepper paste to the broth simply because I was too lazy to open a new can of tomato paste. I really liked the deep flavours from both pastes, but feel free to use only tomato paste if that is what you have on hand. I omitted the bread completely, so I doubt this is still a ribollita proper, but it sounds like a wonderful addition for this hearty soup. 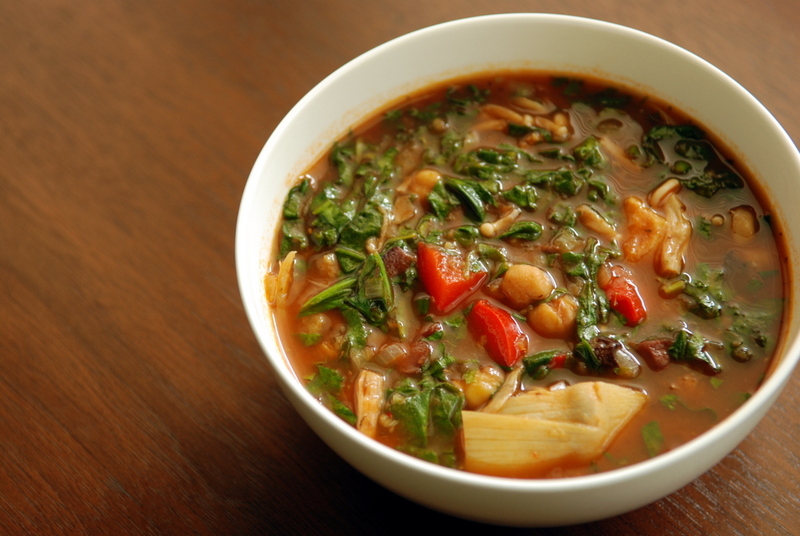 Which soups are warming your belly this winter? This is my submission to Deb for this week’s Souper Sundays and to this month’s Random Recipe. Did you catch the news about the Mediterranean diet preventing heart disease? I won’t rehash the study, but it compared a Mediterranean diet (either with supplemental olive oil or nuts) with a supposedly “low-fat” diet (which was not low-fat due to poor adherence) in over 7000 people at high risk for heart disease. In short, the study intervention (in addition to medication) was to eat high levels of vegetables, fruits, nuts (almonds, hazelnuts and walnuts), legumes, fish, and olive oil. The full dietary recommendations are listed in their appendix here: a) lots of olive oil (at least 4 tbsp if in the olive oil arm of the study), b) at least 2 daily servings of vegetables, c) at least 2 daily servings of fruits, d) at least 3 weekly servings of legumes, e) at least 3 weekly servings of fish, f) at least 1 weekly servings of nuts or seeds (at least an oz of nuts a day if in the nuts arm of the study), g) white meat only, h) olive oil-simmered tomato-onion-garlic sauce at least 2 times a week. Raw and unsalted nuts, eggs, fish, seafood, low-fat cheese, dark chocolate (with at least 50% cocoa) and whole grain cereals were encouraged. A switch to red wine as a primary source of alcohol was encouraged in people who normally consumed alcohol. Other sweets, pastries, red meat, fatty cheese, cream, butter, potato chips, and French fries were discouraged. Their suggested recipes are posted online, however in Spanish. Turns out there was a benefit in reduced myocardial infarctions, strokes and deaths in both arms of the study group compared to the controls. So much so (a whopping 30% reduction) that they stopped the study earlier than anticipated due to a reduction in heart disease. It would be unethical to allow people to continue with the control diet when the intervention was so much better. Not that all heart disease was eliminated entirely, it was reduced. Most remarkably, the dietary changes improved outcomes in addition to their medications. Sounds like a radical diet? Cut out the crap and eat the good food? Sometimes I feel like most of the benefits from so-called diets, whether it be plant-based vegan, Paleo or the Mediterranean diet, are mostly from removing the processed foods and replacing them with wholesome whole foods. Start cooking your food at home. As both the oil and nut arms of the study improved outcomes, it is difficult to pinpoint the important parts of the diet. That’s the hard part of nutrition research. Do you need fish (unlikely) or the omega 3 fatty acids? Do you need to drink red wine? Which fats are important? Interestingly enough, despite improved heart health, no one lost weight on this diet. Following a plant-based whole foods approach is what makes most sense to me. As mentioned in the New York Times article, others support a no-oil vegan diet for reducing heart disease. Instead of oil, fat comes from nuts and avocados. I don’t plan on changing my focus (BEANS and GREENS!) but for some reason I seem to have a hankering for more Mediterranean-inspired meals recently. I may go find myself some olives, too. Ever since I really enjoyed my Spanish Chickpeas and Spinach with Roasted Garlic, and munching on my very freezer-friendly Greek Stewed Swiss Chard with Tomatoes, Mint and Lima Beans, I have been on the look-out for more ways to cook down my greens in a skillet. 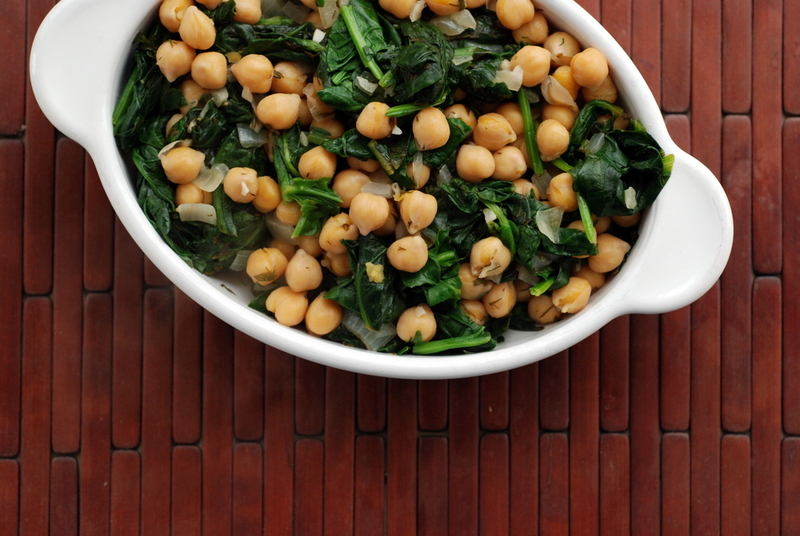 Enter this super easy Greek chickpea and spinach skillet with lemon and dill. It looks deceivingly simple. It does not deceive you: it is simple. It deceives you because it tastes a lot better than you might think. 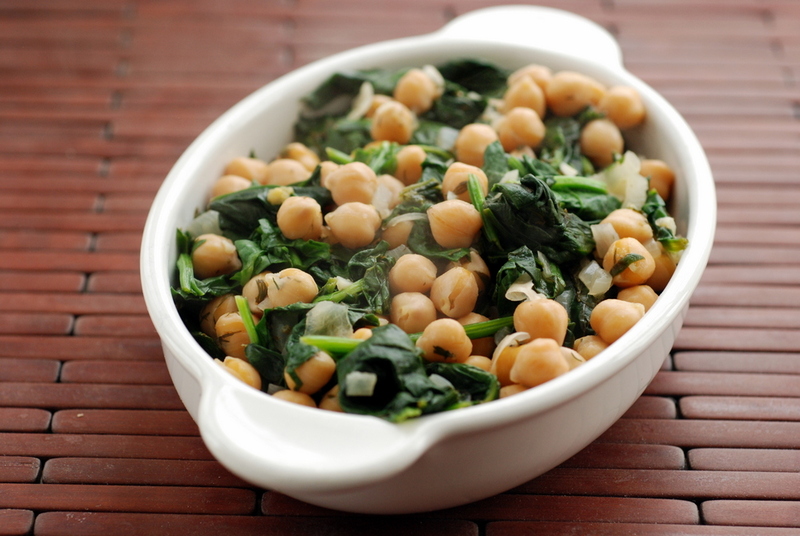 You can taste each component of the meal and the lemony-dill aspect complements the nutty chickpeas and silky spinach. The chickpeas ended up creamy, too, with the brief cooking in the pan…. and the spinach, well, its wilts away, allowing you to eat a lot more greens than you may have thought possible. Any thoughts on the diet du jour? Any recommended Mediterranean recipes? This is my submission to this week’s Weekend Herb Blogging, hosted by Elena, and to this month‘s Herbs on Saturday. After boldly stating that I can easily munch through a weekly food budget of $15, I had a few people suggesting I share my tips. I have been meaning to write this post for a while, so I apologize for its delay. Without further adieu, here are my tips. First of all, my biggest tip is do not waste any food. I try really hard not to waste any produce. I make weekly meal plans incorporating the ingredients I already have and what I want to buy. Know was needs to be consumed quickly (strawberries!) and what can wait (sweet potatoes!). Know what needs to be refrigerated (greens!) and what does not (tomatoes!). Freeze leftover veggies and meals. When red peppers go on sale, I stock up because they can be easily frozen. No need to blanch or cook beforehand, just chop and freeze. Afterwards, they are also easy to throw into whatever dish you end up using them in – they’ve already been pre-cut! 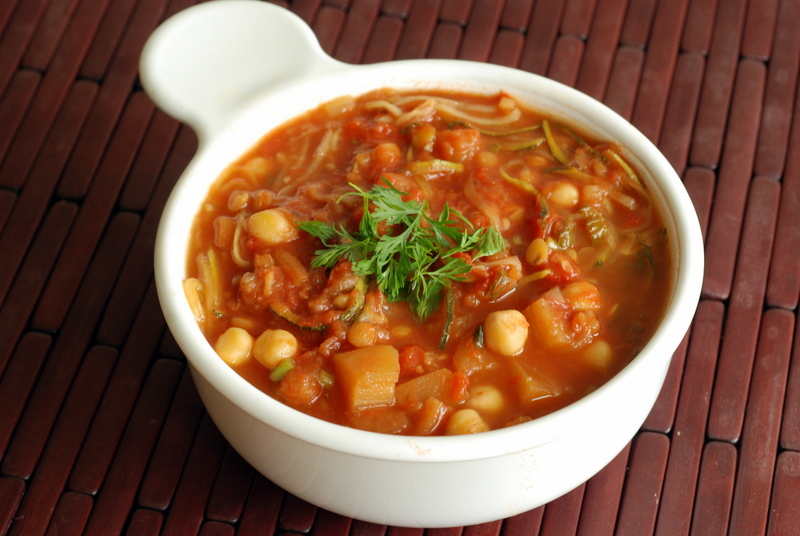 Soups and stews can easily be frozen and reheated when you want to eat them again. Beans are cheap, healthy and store well. I routinely make a big batch of beans and freeze them with their stock in containers in 2 cup measurements so it is just like pulling out a can of beans. Quick cooking beans like red lentils are also great for easy soups and curries. My Mom calls me a hoarder. I think of myself as buying in bulk. This technique doesn’t work for everyone, but if you have the space, definitely consider it. When certain staples go on sale, I stock up. 2 kg of red lentils for $2? Yes please. That will likely only last 2 months anyhow. Steel cut oats, same thing… Cans of coconut milk and tomatoes will also always find a use. If possible, grow your own food. I have been dabbling in gardening, focusing on higher yielding vegetables (beans, zucchini) and greens such as kale and collards since they do not need to be harvested immediately. However, even for those without much space, my herb garden has been the most prolific and rewarding, both in the garden and in my kitchen. Being able to snip off a handful of fresh herbs for your meal makes your meal go a long way. 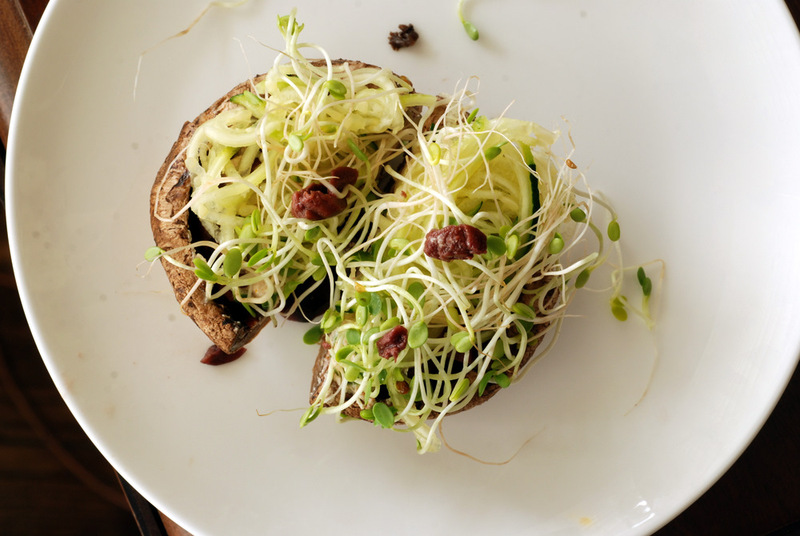 Even if you are hard-pressed for sun, you can grow your own sprouts. I almost didn’t include this tip since it is pretty obvious. Save money by cooking for yourself. Don’t eat out at restaurants. Don’t buy premade seitan. Pack your own lunch and cook things yourself. The above tips are more general but I wanted the heart of this post to be about my favourite local stores. I currently live in an area that has plentiful options for groceries, so every week I scour the flyers and figure out what I need to buy based on my meal plan. Ethnic grocers are usually a great place for reasonably priced ingredients. Sales often vary, but there are stores that I know I will usually find great prices. Sunny’s Supermarket – I don’t live close to Sunny’s anymore, but it has an awesome selection of nearly every ethnic cuisine, except the standard North American diet. Milk and cereal might be there, but it isn’t as cheap as the red lentils and tofu. It has a very extensive spice collection with high turnover for its produce, beans and grains. Weekly sales are great and they often have random produce on sale, too. It is not uncommon for red lentils, chickpeas and split peas to sell for cheap ($2 for 2 kg). Bestwin is a similar supermarket, not too far away, but it is more dingy and not as big as Sunny’s. Lucky Moose in Chinatown – I have started to bike past Chinatown when I come home from work. I think this is one of the better priced grocers with good quality produce. I never know what I will find on sale though… bananas for 29c/lb, zucchini for 39c/lb or young Thai coconuts ($2/2). Like most Asian grocers, “exotic” mushrooms like oyster mushrooms, shiitake and enoki are always reasonably priced. Snow peas and snap peas, too ($2/lb). Welcome Food Mart – This is my neighbourhood ethnic grocer. A transplanted Chinatown grocer with oftentimes questionable produce but there are some good deals to be had. They have a weekly flyer and they constantly seem to sell 10 limes for $1 which suits me perfectly. Tutti Fruiti in Kensington Market – Kensington Market is our local stop for bulk items, like nuts when they aren’t on sale elsewhere. I have started to use more Brazil nuts in recipes because they are cheaper here than walnuts and pecans! Protein powders are also very reasonably priced (Hemp Pro 70 is $19) and tempeh is the best price in town. Don’t like Tutti Fruiti? Try the neighboring Essence of Life instead. Ambrosia – My favourite health food isn’t that close to me, but when we are in the area, we stock up at Ambrosia. Monthly specials can be great on top of great regular prices. Quinoa for $2.44/lb? Yes please! They also seem to stock the majority of all my wacky kitchen needs (I buy my nutritional yeast and vital wheat gluten here). Bulk Barn – I don’t find Bulk Barn to have good prices but if it is your closest bulk store, so be it. Buying only what you need is the way to go. The one time you will find me in Bulk Barn is when their oats are on sale for 79c/lb and I couple that with a $3 off $10 purchase coupon. Cheap oats, please! J-Town – I don’t find J-Town that inexpensive but it is a nice place to stock up on all your Japanese needs. I am listing it thought because it sells Mori-Nu silken tofu for $1.68. Booyah! No Frills, FreshCo and Walmart – Of all the big chain grocery stores, these are my favourites even though I don’t shop there that often. No Frills and FreshCo stock ethnic vegetables, depending on their neighbouhood, too. Surprisingly, Walmart has good prices for nuts and dried fruit. It has a reasonable selection of ethnic ingredients. I even spotted my much loved package of peeled garlic at Walmart, too. All three stores also have a nice price matching policy, that includes grocery items. I really like that because I can still go shopping on a Wednesday and know my produce will be in-stock at the grocers that price match. 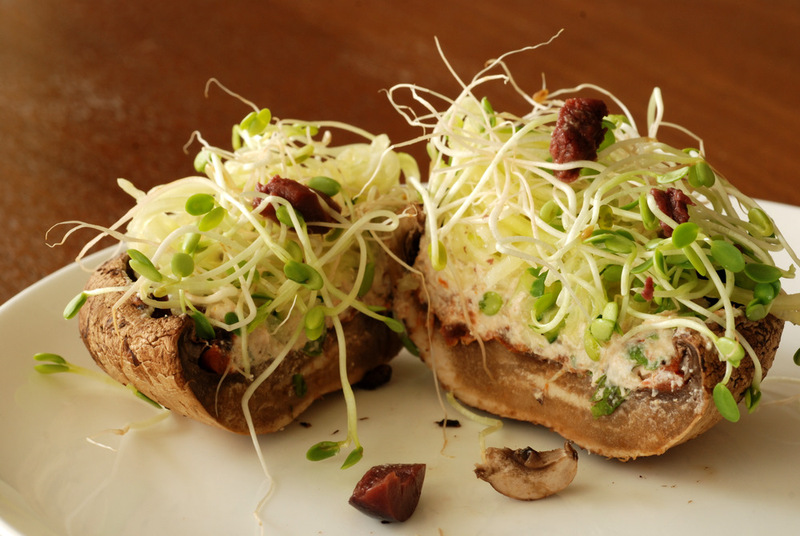 Do you have any other great tips for eating well as a vegan? Any other places in Toronto that you recommend? Feel free to peruse my archives for what I actually eat on a day-to-day basis. I have a bad habit of not sharing some of my most easy pantry-friendly meals. 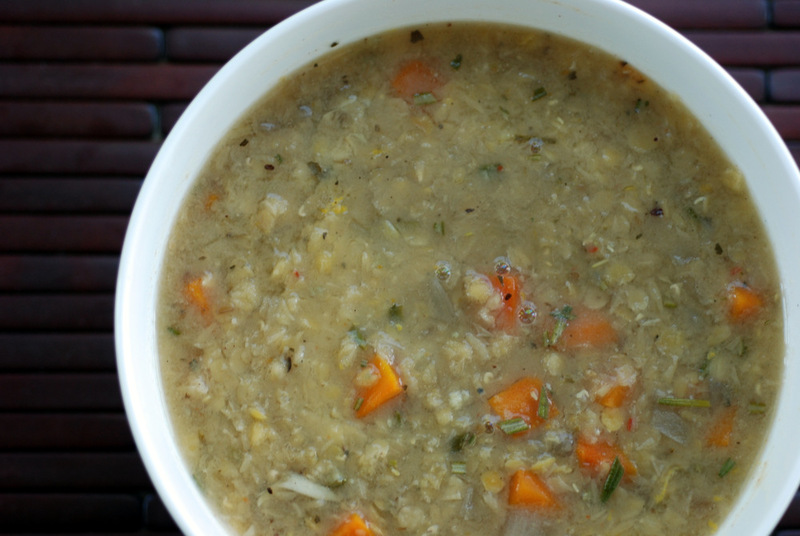 Possibly because red lentil soups are not always photogenic. That doesn’t mean they don’t taste as good, so I encourage you to dive past the murkiness of this soup and give it a try. 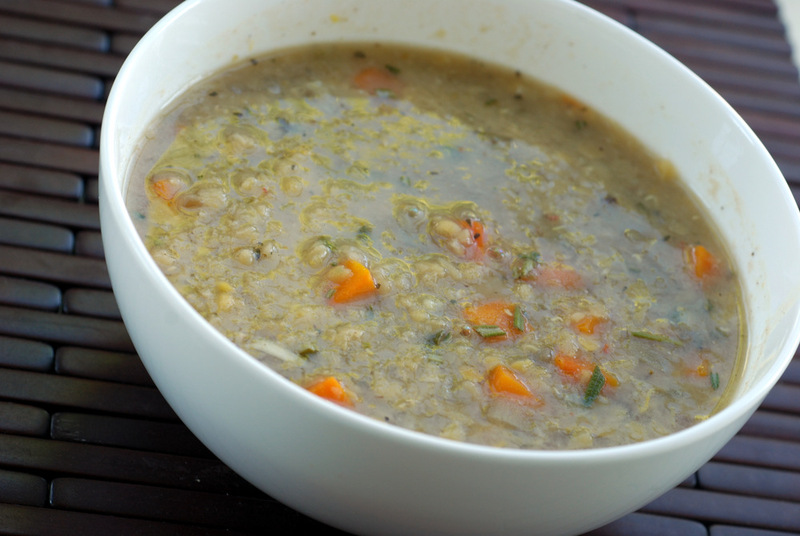 This Greek red lentil soup is very simple, yet tastes great. 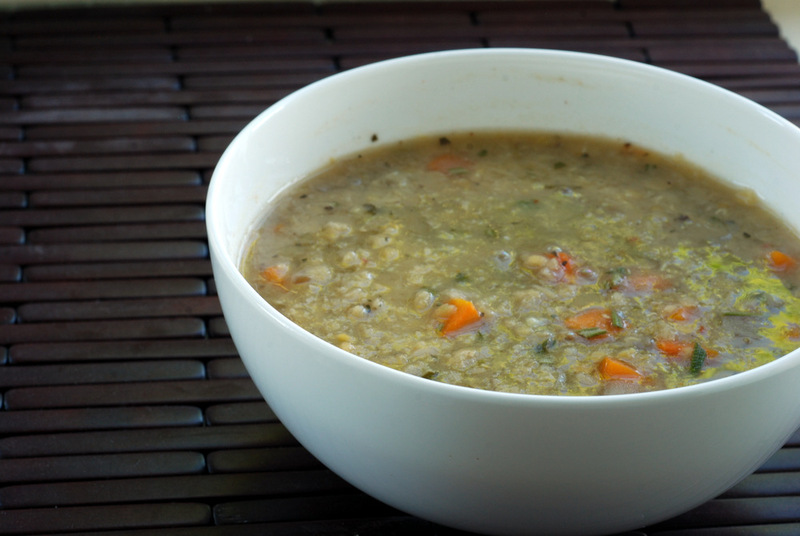 The soup stock is based from sauteed onions, garlic, carrots and bay leaves which are simmered with red lentils infused with rosemary and oregano for the touch of Greek. The soup is finished with lemon juice and zest to bring it up a notch and complement the herbs. The entire recipe makes a big pot of soup, so I encourage you to freeze half for a rainy (or snowy) day. This is my submission to Deb for this week’s Souper Sundays, this week’s Virtual Vegan Potluck Linky, to this week’s Soup Potluck Party, and to this week’s Healthy Vegan Friday. This has been the summer of cherries. Local cherries arrived early, so by the beginning of July I had already made Almost Raw Chocolate Banana Crepes with Almond-Coconut Cream and Cherries, then balsamic cherries migrated onto a sandwich with rosemary cashew cheese and arugula, and I pickled a bunch in a five-spice spiked vinegar. I kept on thinking cherry season was over, but they continued to be on sale late into the summer. How can you say no to cherries at 99c/lb? So, yes, I have yet another cherry recipe. Turns out that when we went to book my airline tickets, we were not able to get the flights we wanted. So for the long weekend, Rob went to New York for work, and I stayed at home. 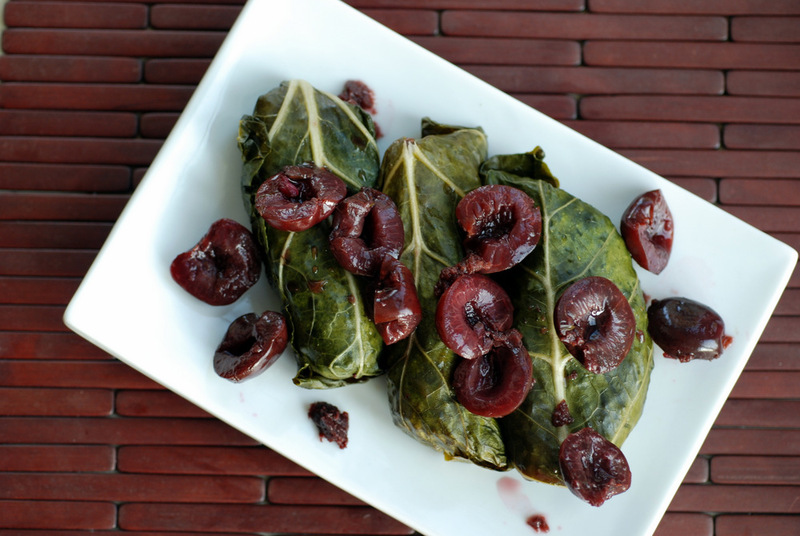 With a bit of extra time on my hands, I decided to tackle my own cherry dolmas. 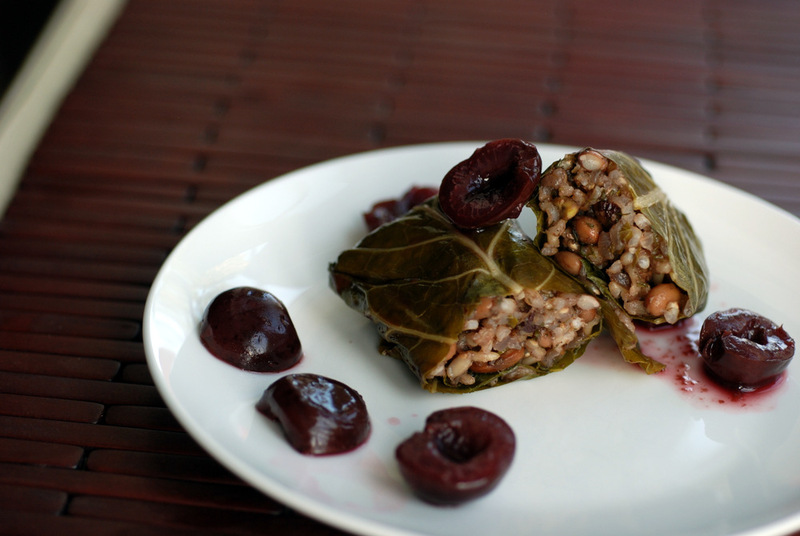 In retrospect, a raw version would likely have been quicker, but I opted for a more traditional cooked dolma. 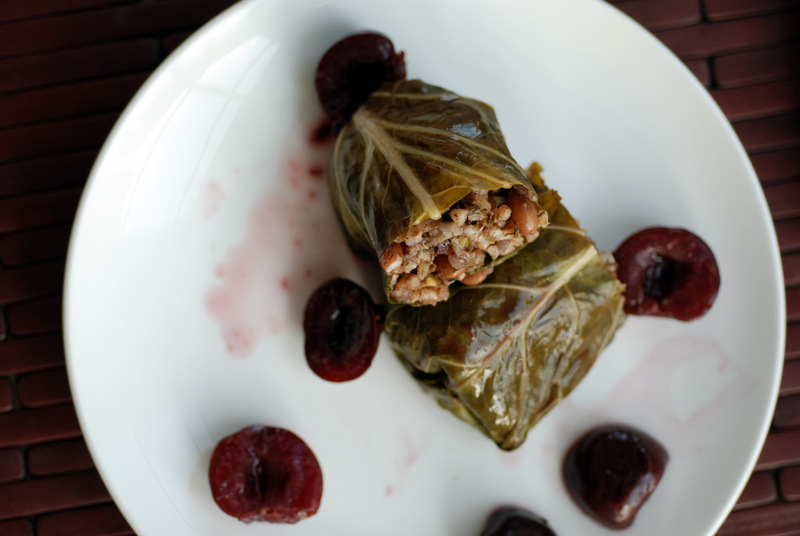 As traditional as cherry dolmas can be. 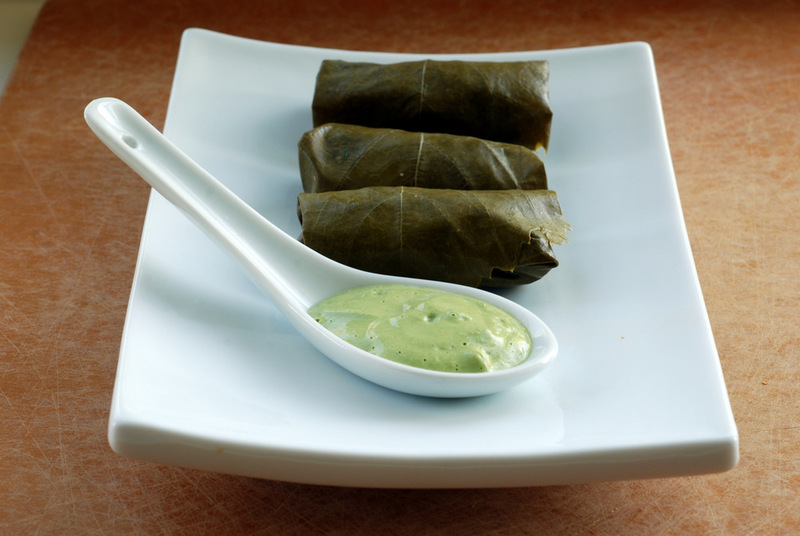 When I visited Turkey, I was not wowed by dolmas. They were not on my radar. 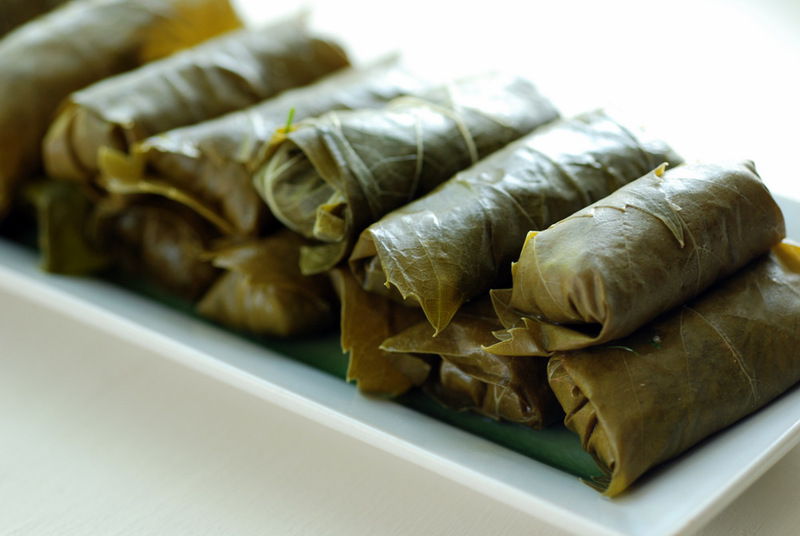 However, traditional dolma recipes typically include savoury spices like cinnamon and allspice, so I was sold. Instead of pine nuts, I used pistachios. Instead of traditional raisins, I used a touch of currants. The majority of the sweetness comes from the cherries. Instead of a rice-based dish, I beefed it up by including white beans. Doing so made me have a lot more filling than I had initially bargained for, so I scrapped the grape leaves and plucked collards from my garden instead. 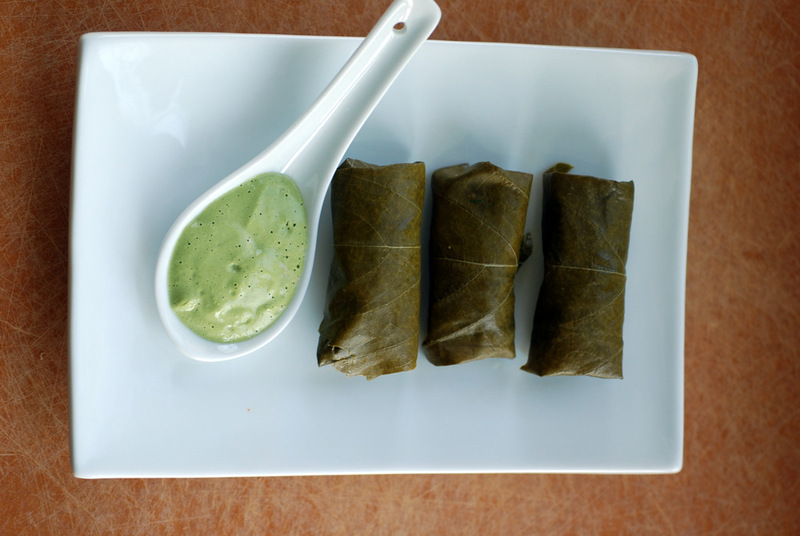 With a cooked filling, a cooked collard seemed more appropriate, instead of my typical raw collard wraps. Pre-steaming the collard leaves made them much easier to wrap the filling and keep their shape. 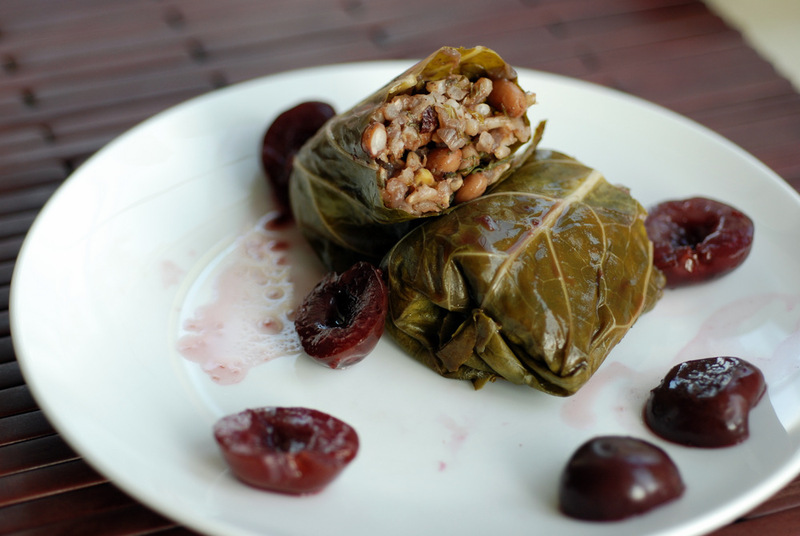 I made the cranberry-lemon-tahini dip for the dolmas but I didn’t find it needed a dip. In fact, the sweet on sweet clashed. If you want something to serve it with, a plain yogurt would be nice. With all my cherry fodder this summer, Rob came back with a surprise present for me from New York: a cherry pitter! This is my submission to this month’s Herbs on Saturday, to this week’s Weekend Wellness and to Simple and In Season. Are you tired of wraps and salads but still want to pack in your veggies? 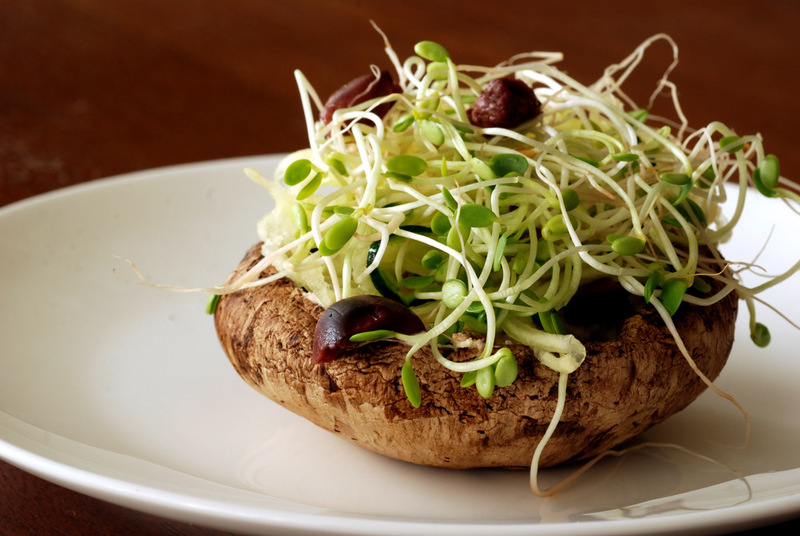 Enter Pizza Bella: a raw portobello mushroom pizza. Since our move, Rob and I have lost easy access to a barbecue but that hasn’t stopped me from enjoying portobello mushrooms. I still adore grilled portobello bliss but variety is the spice of life. With my leftover cocktail sauce from the Raw King Oyster “Calamari”, I knew I wanted to use it towards pizza on a fungi. In fact, my idea for this came from my visit to Houston, where I had a similar meal from Pat Greer’s Kitchen (see Ashley’s Pizza Bella review here). Everyone keeps reminding me that Houston is America’s fattest city and they only eat meat. I protest, you can find healthy take-away foods, even in Houston: you just need to know where to look. When I had my interview in Houston, I wasn’t able to visit the store front of Pat Greer’s Kitchen, but with advance ordering, she was able to deliver her foods to a nearby My Fit Foods store. With a few fresh, raw meals now packed in my hotel mini-fridge, I was all set to bring my A game for my marathon of interviews. What I was most impressed at was that the mushroom seemed to be raw. I wasn’t even sure it was marinaded, but as a raw mushroom, it kept its shape well while holding a nice tomato sauce, a sunflower-cashew cheese, topped with spiralized zucchini, olives and carrots. For my version, I opted to marinate the mushroom in a touch of apple cider vinegar to soften it slightly as I prepped my sauces. My tomato sauce was ready-to-go but now I had to decide on a cheese flavour. In the end, I went with Gena’s Italian cashew cheese flavoured with sun-dried tomatoes and fresh basil. I made it with my food processor, instead of my Vitamix, hoping to get a more cheese-like consistency, but it still was no match to real ricotta cheese. It still tasted great, though, and worked really well with the contrast from the lemon-tomato sauce. I like the shredded zucchini and olives from Pat’s version, so I included that, along with a mound of sprouts as toppings. I ran out of mushrooms, so I ended up freezing the extra cashew cheese in ice cube trays, so I can pop them out whenever I want a single serving of pizza cheese (thanks for the tip, Zoa!). 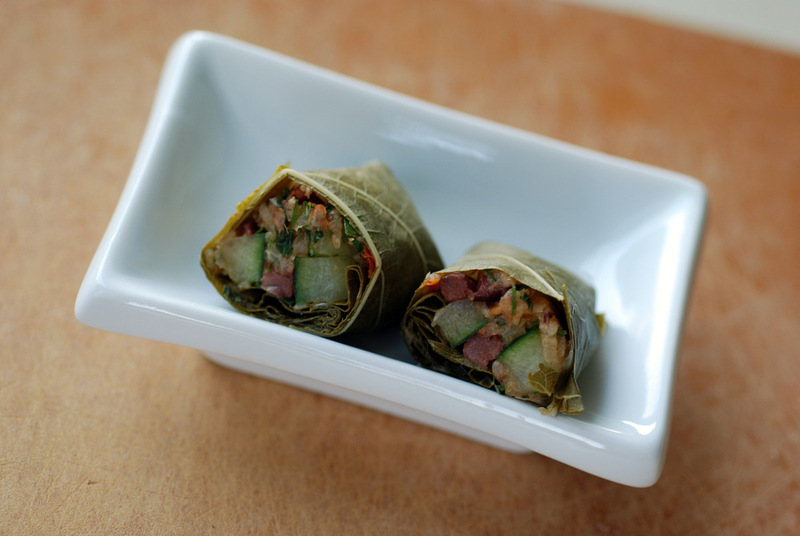 This set of ingredients would also work well in a collard wrap, or overtop zucchini noodles. This is being submitted to this week’s Weekend Herb Blogging, hosted by Susan, to this month’s Ingredient Challenge Monday for mushrooms, and to this week’s Raw Thursdays. Amongst my closer friends and family, I am the only vegan. Quite a few of my friends are vegetarian, but my closest vegan buddy is in Vancouver. That’s across one big country. One of my co-workers is a former vegan, choosing to eat fish as an omega supplement mostly. 😉 I have yet to know anyone who has tried raw cuisine without my influence. Most of my friends are adventurist eaters, so I can share my kitchen successes and failures. While I eat vegan mainly for health and environmental reasons, sometimes I wonder about connecting with other like-minded souls. A few months ago, I travelled with Rob to meet some of his friends from Burning Man. While mostly everyone was vegetarian, it was exciting to meet someone else who also dabbled in raw cuisine. She encouraged me to try banana chips in the dehydrator and told me about one of her raw successes: King Oyster Calamari from Living Raw Food by Sarma Melngailis. Sarma’s restaurant, Pure Food and Wine in NYC, is my favourite raw resto to date, so I was eager to try the dish when I got home. King oyster mushrooms were on sale, too, to boot. I didn’t have the cookbook, but a quick google search led me to Emily’s site which had the recipe. The recipe was simple: marinate king oyster mushrooms, bread them with spiced ground flaxseeds (works as both the breading and egg-substitute!) and then dehydrate. My new-found friend also gave me a few other tips. While the recipe says to dehydrate for 2-3 hours, she suggested dehydrating up to 5 hours for them to become really crispy. She also warned me that the whole recipe made a ton of food, so I halved it. (I also quartered the cocktail sauce below, since I ended up thinning it and had an overabundance of sauce leftover). I tinkered with the recipe since I don’t have an Italian spice blend, and instead added whatever looked like an Italian spice from my spice drawer: basil, thyme, marjoram, oregano, sage, parsley. I threw in some dried onion and garlic granules as well as lemon pepper seasoning instead of the black pepper. Even though I used chili powder, too, I dipped my finger in and thought something was missing. I added black salt. Now we were set. (Note to self: next time I may try this with nutritional yeast and smoked paprika, since I liked that with my Asiago-crusted baked zucchini sticks). I had a bit of leftover crumbs, so you could probably increase the number of mushrooms with this mixture – or pack it in more than I did. Now, if you don’t have a dehydrator, do not fear. 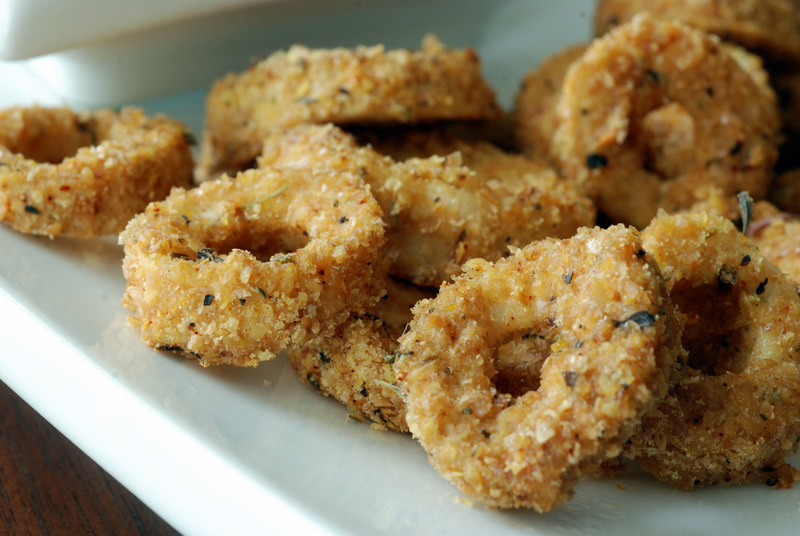 You can still make vegan calamari! I made these both ways: raw in the dehydrator for 3 hours and a separate batch for 10 minutes in the oven. I don’t care too much about the raw philosophy of not cooking over 115F, but I love the inventive recipes… so to hurry things up, I stuck some in the oven, too. Both were good great. They honestly tasted like calamari. No hidden mushrooms here (Rob thinks he could taste mushrooms but only because he knew they were in there). Between the two versions, though, I preferred the raw dehydrated ones. They were more crispy and the breading stayed on (some of it stuck to my silpat in my oven version). 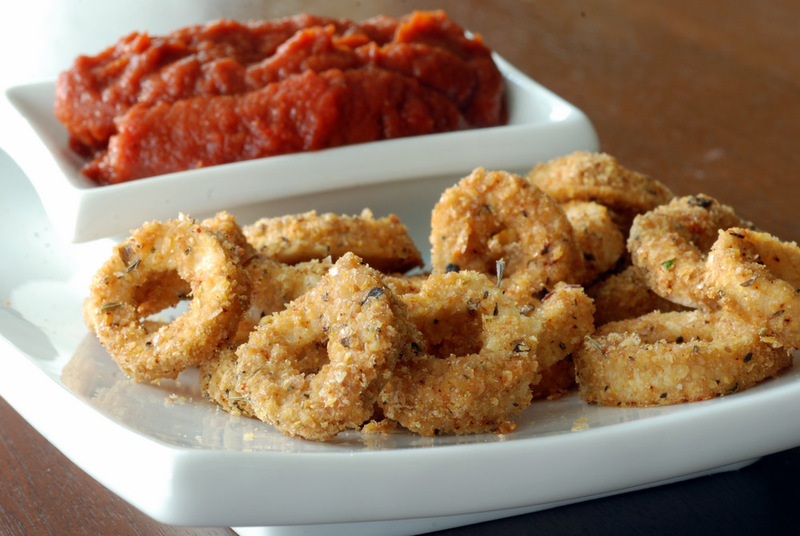 The oven-baked version had more of a slippery calamari feel to it, though. 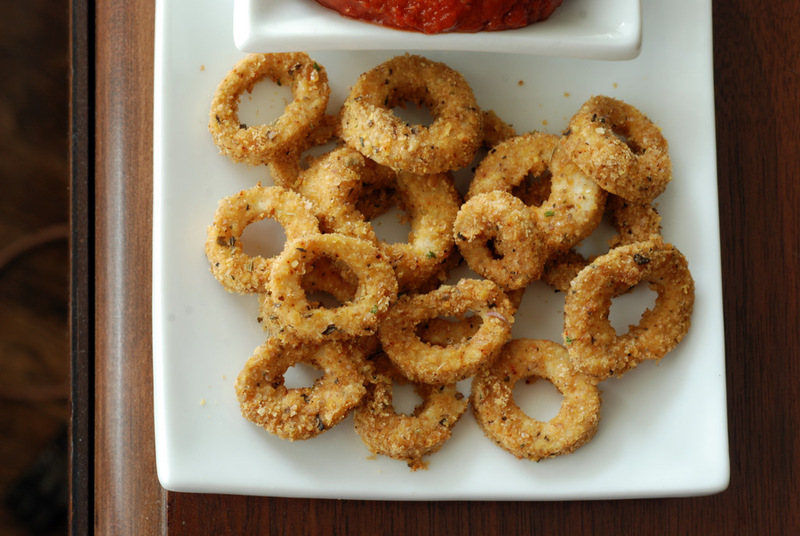 In any case (or in both cases), Rob said he liked them better than regular calamari since it has a cleaner taste. I also preferred this version instead of the typical deep-fried options you find at restos. Bright and fresh, healthy food, what’s not to like? Speaking of connecting with other like-minded souls, I was wondering if I have any readers in the GTA that would like get connected? I was really sad I missed Sarah’s potluck in the park, especially since it looked like it was a lot of fun! This is being submitted to this month’s Monthly Mingle featuring yellow foods and to this weeks Raw Foods Thursdays.